More and more organizations are beginning to embrace both Infrastructure as a Service (IaaS) and Platform as a Service (PaaS). These organizations have already begun asking why PaaS and IaaS management facilities must use different management frameworks. It only seems natural that IT organization’s customers should be able to select both IaaS and PaaS elements during their self-service workflow. Likewise, operations teams within IT organizations prefer to be able to utilize the same methods of policy, control, and automation across both IaaS and PaaS elements. In doing so operations teams could optimize workload placement both inside and outside their datacenter and reduce duplication of effort. This isn’t just a realization that customers are coming to – analysts have also been talking about the convergence of IaaS and PaaS as a natural evolutionary step in cloud computing. 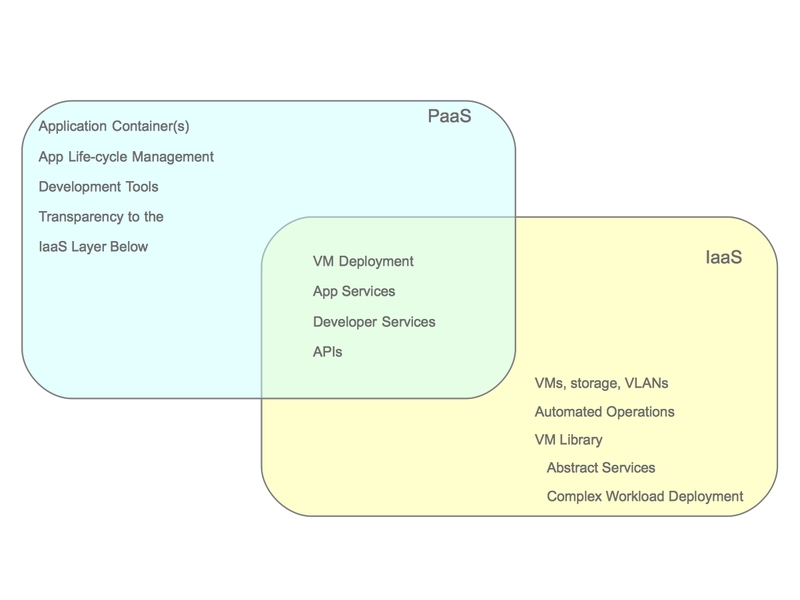 This convergence of IaaS and PaaS is something I referred to as a Hybrid Service Model in a previous post, but you may often hear it refereed to as Converged IaaS and PaaS. There are many detriments an IT organization that does not embrace the convergence of IaaS and PaaS will face. Some of the more notable detriments include the following. Developers accessing two self-service portals in which the portals do not have knowledge of each others capabilities leads to slower development and greater risk of human error due to less automated processes on workload provisioning and management. Operations teams managing IaaS and PaaS with two management facilities will be unable to maximize utilization of resources. IT managers will be unable to capitalize efficiently without an understanding of both IaaS and PaaS models. For these reasons and many more, it’s imperative that organizations make decisions today that will lead them to the realization of a Hybrid Service Model. There are two approaches emerging in the industry to realizing a Hybrid Service Model. The first approach is to build a completely closed or semi-open solution to allowing for a Hybrid Service Model. A good example would be a vendor offering a PaaS as long as it runs on top of a single virtualization provider (conveniently sold by them). The second approach is one in which a technology company utilizes an approach based on the tenants of an Open Hybrid Cloud to provide a fully open solution to enabling a Hybrid Service Model. I won’t go into all the reasons the second approach is better – you can read about that more here and here – but I will mention that Red Hat is committed to the Open Hybrid Cloud approach to enabling a Hybrid Service Model. With all the background information out of the way I’d like to show you a glimpse of what will be possible due to the Open Hybrid Cloud approach at Red Hat. Red Hat is building the foundation to offer customers Hybrid Service Models alongside Hybrid Deployment Scenarios. This is possible for many reasons, but in this scenario it is primarily because of the open APIs available in OpenShift, Red Hat’s PaaS and because of the extensibility of CloudForms, Red Hat’s Hybrid Cloud Management solution. The next release of CloudForms will include a Management Engine component, based on the acquisition of ManageIQ EVM that occurred in December. Using the CloudForms Management Engine it is possible to provide self-service of applications in a PaaS along with self-service of infrastructure in IaaS from a single catalog. Here is what a possible workflow would look like. Higher resolution viewing in quicktime format here.